New cross/compound slide assembly. I was unhappy with the compound slide as it either was bound up solid and wouldn't move or was so loose that surface finish suffered greatly. I decided to make another one and while I was at it I also decided to replace the cross slide with a new design that would allow the lead screw to be in tension and that included t-slots and a more usable mechanism for chaging the angle of the compound. It is still a work in progress, but there was enough done to start using it to complete itself. This shot is from the headstock end and shows the 4 t-slots. No modifications were made to the lathe to get this to fit. 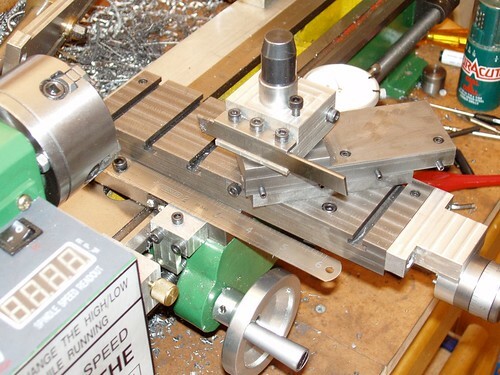 The slide was machined from continuous cast iron bar stock, as uses gib blocks instead of gib strips. 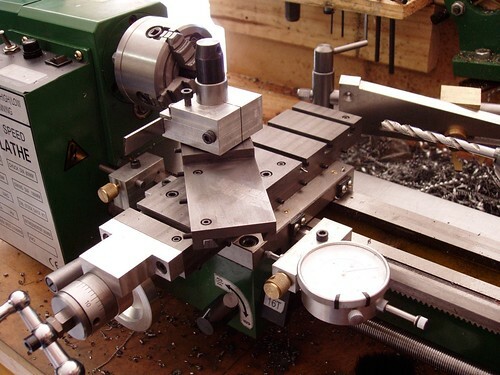 Here is a shot from the tailstock end - you can see the gib block in the compound slide. It is positively held by screws through the top of the slide - this means the adjusting screws can go without locking nuts as they are always in compression. I reused the ball handle and the graduated dial. The aluminium bearing block still has some maching left to do - the top will slope downwards. Here is an overhead shot showing the amount of travel. The 0 end of the scale is roughly on the spindle Center Line. 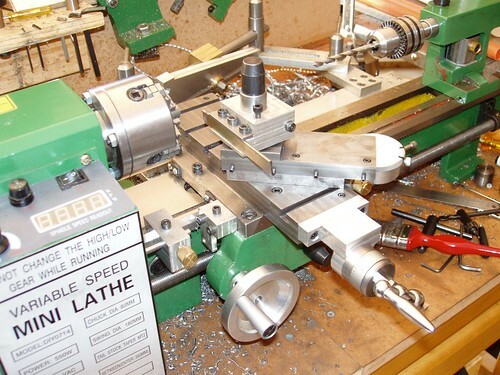 If the compound was set to 0 degrees, there would be no trouble turning to the max swing of the lathe. It hasn't come out all that well in this photo, but the chequered pattern on the compound is some hand scraping I was experimenting with.